Today is a day for reflection and quiet. I would like to share a poem written by one of my favourite poets – e. e. cummings. Anyway, I hope all of you have a wonderful Easter weekend. 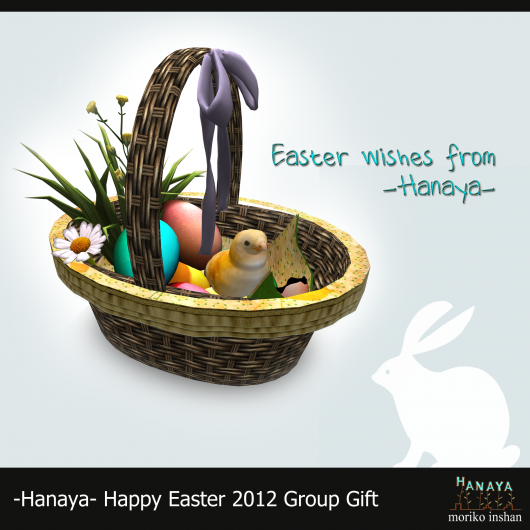 A little gift from us to you has been sent out on the -Hanaya- Yummy Collectibles VIP group, and is also available at our in-world store. For those of you not currently part of our group, please note that there is a 250 Linden group join fee. It has been sometime since we participated in a hunt, so it seemed like the very well organized Evil Bunny Hunt was the one to pick. 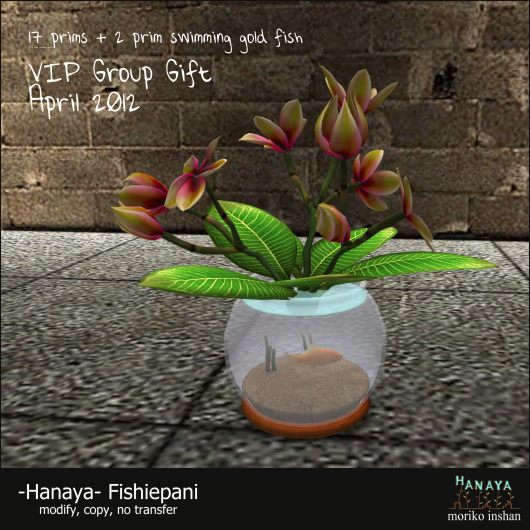 Our gift is the -Hanaya- Garden Pond with Bench as illustrated in the above image. The pic was snapped at our home sim and my brother-in-law Lance Corrimal is the one loitering on the bench with me. We are also one of the event sponsors for the hunt, so another yummy -Hanaya- product is hidden in a golden egg at the end of the hunt. This entry was posted in Events, Freebies and Gifts on April 6, 2012 by moriko. What do you get when you cross a frangipani plant with a goldfish in a fishbowl? At least that is what my partner Yuukie suggested I call this whimsical creation, which is this month’s group gift for -Hanaya- Yummy Collectibles VIP group. The gift was sent out on the group yesterday, so if you missed it, please check group notices or pop by our in-world store. It is rezzed in the Customer Information area, and will remain there for the rest of the month. When you unpack the boxed item, please make sure you rez the gift in edit, as the swimming fishie cannot be linked. This entry was posted in Freebies and Gifts on April 2, 2012 by moriko.